January 30, 2012 Joanna Robertson, RN, a nurse on the third floor medical-surgical unit at Beebe Medical Center, has been honored with the You make a Difference Award for January 2012. Joanna has been recognized for her tireless work toward improving patient care by leading an effort to institute the evidence-based practice Bedside Reporting. The practice is a patient-centered initiative that allows the patient to participate in the nurses' routine shift-change reporting process. Research is showing that the practice improves communication between nurses and caregivers, as well as between the patients and their nurses and physicians. Traditionally, nurses do not meet in patient rooms when they discuss patients. 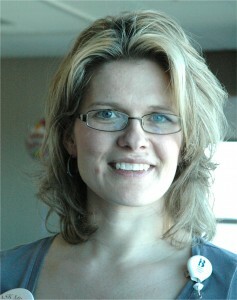 Joanna Robertson, RN, Beebe medical-surgical unit Nurse, has been honored with the You make a Difference Award for January 2012.